I am very excited to bring to you my first author interview with Emma Michaels author of the Thirteenth Chimes. As a Book Blogger turned author Emma Michaels started her blog in December of 2009. With the support of her amazing blog followers and fellow bloggers she was able to not only write her first completed novel but start off a new career as an author. 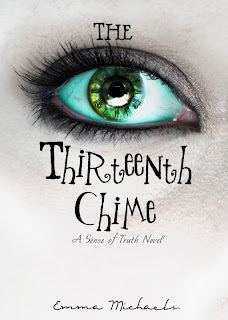 With her Debut novel, The Thirteenth Chime being released August 13th 2010 and future releases planned Emma Michaels aspires to one day make it to the top ten of the New York Times Best Sellers List. With her fiancé at her side and her small white Chihuahua, Hope, she writes, reads, reviews and tries to live everyday to its fullest, whether in the pages of a good book or reaching out to others through her words. Emma's debut novel looks amazing. I personally love reading debut authors novels which is one of the reasons why I signed up the The Story Siren's debut author challenge (albeit late) this year when I first started the blog. Here's what Emma had to say for herself (for the record she is the nicest lady you'll ever have the opportunity to talk to. Q) Describe your journey from a blogger into a publisher author? A) I began blogging shortly after I began querying my first book. I have always loved books and for me, it was a natural and wonderful step to take in sharing my thoughts and feelings on books with others who would in turn do the same with me. What I really love about my blogger experience is that I was able to share all of the journey with fellow bloggers and blog readers. All of you were with me from the first step I took until I arrived at my destination. Now the true journey begins for my debut novel, "The Thirteenth Chime", and I hope all of you will continue with me on this journey! Q) Where did you get inspiration for your novel from? A) I had the inspiration for the book shortly after coming to Washington one night during a bad storm that knocked the power out in my area. We went next door to share a few candles and for the company. Lightning flashed and thunder shook the house, lighting up the room we were in even through the draperies. Then the the sky was silent. The silence made my breath catch and in the next moment, the antique grandfather clock in the house began to chime. The sound echoed throughout the house and made my heart jump into my throat. I unconsciously reached out to hold someone's hand, yearning to feel a bond, and it was in that moment that "The Thirteenth Chime" was born. Q) Describe your main character Destiny. A) Destiny is a curious character to me. I'm a girl too, and in many ways I can relate to her thoughts and actions, but on the other hand there are some ideas of her I disagree with, especially pertaining to David. She is, in many ways, the swinging pendulum of the book. She felt that her life had finally gotten in order where she wanted it only to have chaos find her. Although it is David who comes to help her, I think most of the credit in helping Destiny goes to Stephanie, who in many ways is the most human of the trio. No matter where the future will lead Destiny, I'm sure she will never be the same after what she faces in "The Thirteenth Chime". 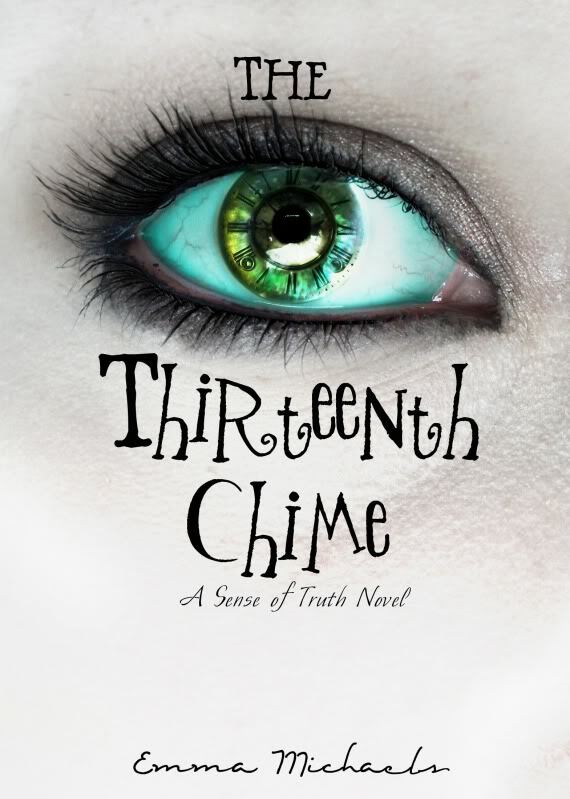 Q) I love the cover of the thirteenth chime. Was it the design you originally had in mind for the book? A) Yes! I was very fortunate in how supportive the publisher was of my cover idea and the artist who did the cover did an AMAZING job! A) The first YA book I ever read and truly enjoyed was by Tamora Pierce. She has been a huge source of inspiration for me and I really enjoyed getting to meet her in person. A) George Cooper (from "Song of the Lioness"), Rosto the Piper ( Beka Cooper ), Fred and George Weasley (Harry Potter), and Briar (Circle of Magic). The reason why is because they are the five most mischievous characters I can think of - just imagine the party! Two rogues, two tricksters and just a pinch of thievery. Plus, I can't help but be curious what would happen is George, Rosto and Briar got their hands on some of Fred and George's magic shop items. Oh goodness, that would make an interesting fan-fiction. Q) To sum up explain why everyone should read The Thirteenth Chime in 100 words or less. A) Readers will find there is a sense of realism to the characters that is unlike anything else on the market while staying true to the true paranormal theme of the book. It is a new and original idea, without another one like it on the market (as far as I know.) For readers who want to experience something unlike any other book they have ever read, the essence of "The Thirteenth Chime" delivers straight to the heart. Thank you so much for the interview and to everyone reading!!! Your support means so much to me!!!!! Facebook * GoodReads * Website * More TTC info! I have given you an award. Head on over to my blog to pick up the Versatile Blogger award! Thank you so much for the interview! It was tons of fun!